Section 4: level, junction of posterior mesencephalon and anterior pons. Anterior-Posterior (AP) levels are associated with different parts of the ventricular system. Thus, the fourth ventricle (diamond-shaped in 3-D), is about to change into the more constricted cerebral aqueduct. Dorsal to this is the mesencephalic tectum, corresponding here to the inferior colliculus. Note the horizontally coursing fibers at the dorsal midline, which form the posterior commissure. The corticospinal tract is visible at the ventral midline. The thick roots of the sensory trigeminal nerve exit ventro-laterally. The right and left cerebral hemispheres appear lateral to the brainstem. This is the posterior extreme of the hemispheres, which are in effect cut tangentially through the upper cortical layers. As the sections procede anteriorly, they will include the full cortical thickness and the underlying white matter core. Section 5: This section is still in the mesencephalon, slightly anterior to Section 4. The cerebral aqueduct, surrounded by the myelin-pale periaqueductal gray (PAG) is still prominent. 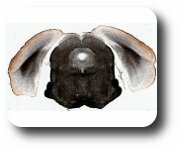 The dorsal brainstem is occupied by the superior colliculus, which has a distinctly more laminated appearance than the inferior colliculus (Ssection 4). Laterally, about concurrent with the PAG is the brachium of the inferior colliculus, composed of axons coursing from that nucleus to the auditory thalamus in the diencephalon. At the more ventral circumference, there is a remnant of the middle cerebellar peduncle; and in the midline, below PAG, fibers crossing in the decussation of the superior cerebellar peduncle. The medial lemniscus, en route to somatosensory thalamus, is evident in the midline. The right and left cerebral hemispheres are seen lateral to the brainstem. These have now been cut through the full cortical thickness . The lateral surface at this level contains visual cortex dorsally and entorhinal cortex ventrally. The medial surface contains hippocampal related structures (presubiculum and subiculum). Note the characteristic white matter core, consisting of cortical projections to other cortical and subcortical structures and incoming cortical and subcortical projections. This section has many of the features of Section 5. The superior colliculus lies dorsally in the brainstem, and subjacent to this is the periaqueductal gray, surrounding the cerebral aqueduct. Ventrally, the myelin-poor interpeduncular nucleus is prominent in the midline. At the base of the brain, there are three discernible fiber bundles. The medial lemniscus, consists of sensory axons coursing from the nuclei fasciculus and gracilis to the sensory thalamus; corticopontine fibers travel medial-lateral among the pontine nuclei; and a remnant of the cerebral peduncles, en route to the pyramidal tract, is located laterally. The corticobulbar component of the tract exits to terminate among the pontine nuclei. The right and left cerebral hemispheres circumscribe the underlying brainstem. The section now cuts truly though the full, 6-layered thickness. Vertical bundles of myelinated fibers interpenetrate the cortex and correspond to exiting or entering axons. At a closer examination, oblique and horizontally oriented fibers are also apparent, and there is a thin band of fibers, below the pia surface, in most areas. The medial surface of the hemispheres contains subdivisions of the hippocampal formation.